Not everyone is in the position to head outside for a run without having to carry anything. If you have stuff you need to bring with you, like keys, water, and a cell phone, you might want to find the best running backpack you can to put all your gear in. Why Would I Need a Running Backpack? If you’re using your lunch break to go for a run, you’ll need a place to stash your purse or your keys, along with your work clothes you’ll have to change back into. Or if you’re an ultrarunner or just out for a moderate 10-miler, you’ll need to bring water, energy gels, and a phone, just in case something happens. You’ll have a place to put all that stuff when you carry a running backpack. Many runners bring backpacks or hydration belts along with them when they are doing training runs for marathons or longer runs. It’s always better to be fully prepared than to be caught mid-run without enough water or a cell phone to call for help if you’ve suffered an injury, are leery of a stranger who has passed by in his car too many times, or if the heat becomes too much for you. Likewise, if you’re into trail running, you might want to pack some basic first aid necessities along with a compass, depending upon how deep into the woods you are going. You may even want to pack some bear spray to take along with you if you’re in their neck of the woods. 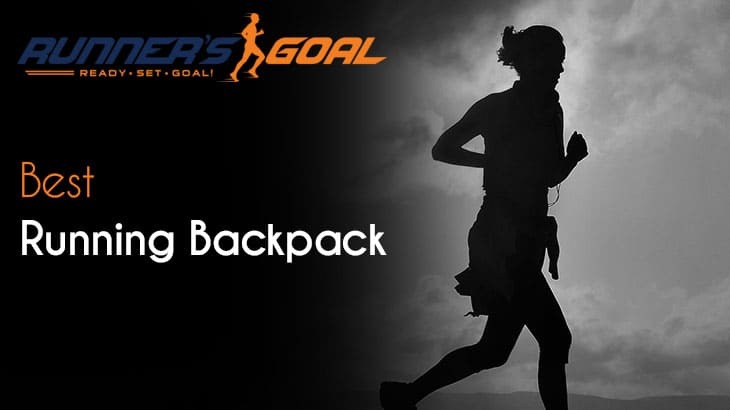 In all those situations, a running backpack can help you out. You won’t be stuck carrying your belongings in your hands where you can drop and lose them. It might not feel as free as running without carrying a load does, but in certain situations, common sense should win out and you should carry some essential items with you. 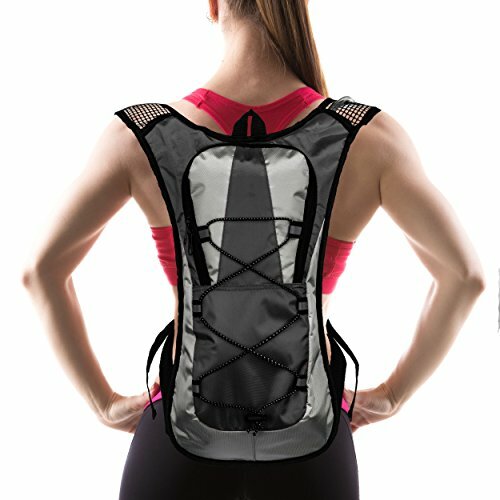 What Should I Look For in a Running Backpack? You’ll have a lot of choices out there, but what works for one of your friends may not work for you. Before buying a running backpack solely on someone’s recommendation, take a look at your needs and expectations before choosing one. Here are some factors you’ll want to consider. How much it weighs: Extra weight is an enemy of all runners. It will slow you down and tire you out much quicker than running without the excess pounds will. You’ll want to find the lightest running backpack you can so you don’t feel like you’re carrying a 20-pound sack on your back. How much space you need: If you just need enough room to store your keys, ChapStick, and an extra bottle of water, you won’t need a big running backpack at all. You’ll be able to get by with a small model. But, if you need to bring a change of clothes, a jacket, several bottles of water, phone, keys, and more, you’ll need a little more room. If you want a hydration pack included: Some running backpacks come with built-in hydration packs, as well as a few pockets to store some smaller odds and ends. You can also get backpacks that don’t come with built-in hydration packs but have pockets for water bottles instead. You’ll need to decide which type you want to go with. How breathable it is: Ideally, you’ll want to find a backpack that’s made of breathable materials, like mesh. You’ll already be working up a sweat while you’re out there running. You don’t want anything to add to that feeling of being overheated. How comfy the shoulder straps are: You don’t want to get a running backpack that has thin shoulder straps that don’t have much padding. You’ll feel those straps digging into your shoulders every step of the way -- suddenly, your fun run will feel like a torture session. Look for thick padding and straps for the ultimate in comfort. If you need a waterproof bag: Runners who are covering longer distances will want a waterproof backpack. It’s harder to predict how the weather will hold when you’re out there for hours and you won’t want some of your items, like your phone, getting wet while you’re running. Safety features: If you like to tear up the trails by yourself, you’ll want to find a backpack with some safety features. A bright, reflective pack will help onlookers spot you, which will keep you safer. Some backpacks also include other safety features like built-in emergency whistles. Price: Running backpacks carry a wide variety of price tags. You don’t have to overspend to find a quality backpack. But, you should also consider whether a super cheap backpack will hold up well over the long term. This backpack will hold a lot of your gear. 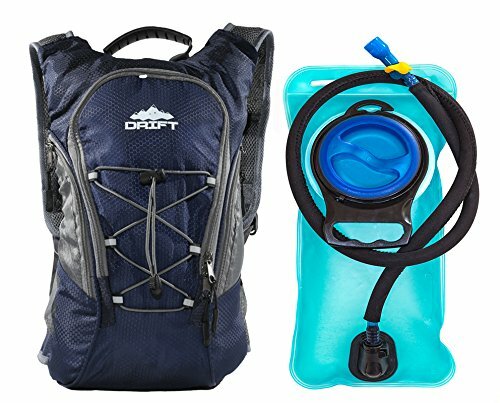 It includes a hydration pack so you never have to worry about carrying water bottles, but, it also includes enough room that you can fit a towel, snacks, your phone, wallet, and keys. It has a 3-liter water bladder that has a wide opening, so you can add ice cubes. The chest and waist straps can be adjusted so that runners of all sizes can find great fits. The back of the pack includes a breathable mesh, so your back won’t feel super hot as you lug your gear around. The bag’s straps have padding, which will mean a more comfortable experience for runners. The bag has a built-in molle webbing system, which means you can attach additional gear to the pack if you need to. This pack only comes in black, which doesn’t offer visibility, and the color will attract the heat, which isn’t ideal for summer runs. The mouthpiece doesn’t have a strap to hold it in place, so it bounces around while you’re running. This backpack is unisex and it comes in two color choices. You can get a dark blue color for people who don’t want their packs to stand out or you can get a red backpack if you prefer more visibility. This bag is super affordable. 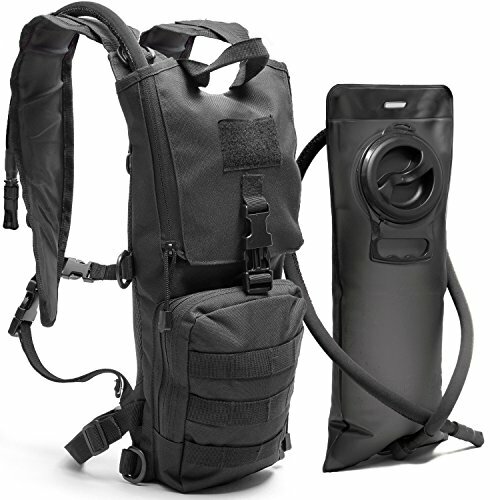 It’s designed with a channel airflow system that keeps you feeling cool, even when you wear your pack for a long time. It’s made of water-resistant nylon, which means your items will stay dry longer if you get caught in a rainstorm. You can remove the straw and the hose off the 2-liter water bladder so they are easier to clean. The bladder opening is large enough that you can use ice if you prefer your drinks cold while you’re running. The bladder is BPA free. You’ll get several pockets for storage, including a pocket for your phone that has an opening for headphones. The hip strap offers a great place to hold your energy gel packs, so you’ll be able to easily reach them mid-run. It has an emergency whistle on the chest strap. If you are a large and muscular man, the pack may be too small for you. Some runners have had a problem with the stitching coming undone after a few uses. Another highly affordable option, this backpack can be used for a variety of activities, including running, camping, hiking, and cycling. This pack comes in four different colors, including bright options, and they all have an eye-catching white section on the backpack for greater visibility. The back is mesh, so you get more breathability on a run. The backpack is made of durable nylon. It won’t put much of a dent in your budget. It has a small front pocket for the little items you carry. The backpack is water resistant. The straps are comfortable, which is important when you’re running because you don’t want the straps digging into your skin with every step. It fits down along your spine, so the backpack doesn’t limit your shoulder movement while you’re running. It’s so comfortable, you can almost forget you’re wearing anything. It doesn’t come with a water bladder in the backpack, but it will hold water bottles. It’s a smaller backpack, so don’t expect tons of storage, but it will hold the basics and won’t weigh you down much. 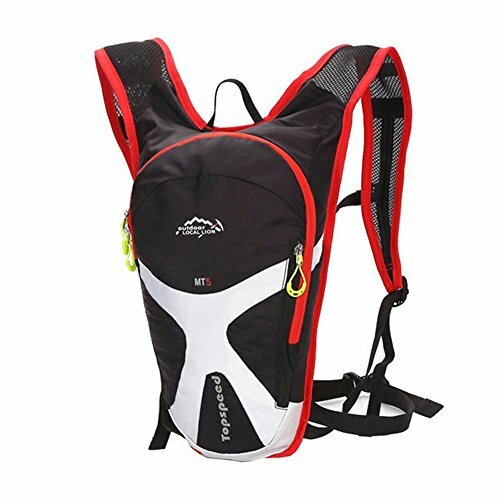 This hydration backpack can be used for multiple sports -- running, cycling, hiking, or climbing. While it kind of resembles those orange jackets you sometimes see construction workers wearing, the bright colors mean you won’t have to worry about being invisible to oncoming motorists. This pack is highly affordable. It comes with a 1.5-liter bladder, so you’ll always have water on your runs. It has adjustable shoulder and chest straps, so you’ll be able to find a fit that avoids bouncing while you’re running. The material is waterproof, so you won’t have to worry about your phone being damaged while running in heavy rains. The bladder has a wide mouth so you can fit ice cubes inside. The shoulder straps are both cushiony and breathable. You get three color choices. The material is thin enough so that you’ll be able to feel the cold on your back if you put ice in your water. It’s a small backpack and it won’t fit larger runners. It can cause some chafing during long runs. These backpacks should appeal to anyone who likes their backpacks to have a military-like appearance to them. You can get them in camouflage, tan, or black. These backpacks are a good choice for bigger runners -- the packs can adjust to fit runners with a 27-inch to 50-inch chest size. It comes with a whistle buckle you can use in emergencies. This pack shouldn’t tear or show a lot of wear -- it’s made of rugged polyester and has PVC lining. It comes with a replaceable 2.5-liter bladder, so if you have issues with the bladder, you don’t have to replace the whole backpack, just the bladder portion. The bladder has a wide opening for ice. The bag has two front pockets to carry your smaller items and give you easy access to them. It has an air mesh back to keep you cool. 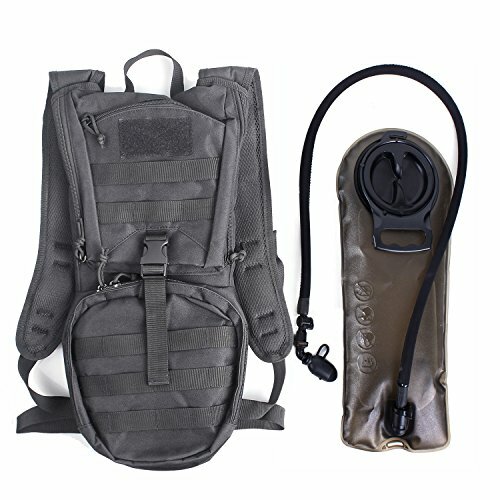 The top and bottom pockets are made of the molle system, so you can attach more molle gear to the pack if you need more storage. The bag is a little heavier than the others on this list -- when it’s empty, it weighs 1.3 pounds. This bag is heavy duty and that is reflected in the price tag -- it’s not the cheapest option on this list. The best running backpack on this list, in my opinion, is the Drift backpack. It’s affordable and it holds a respectable two liters of water. I like that the water bladder is BPA free and you can remove the straw and hose for easier cleaning. The pack has several different pockets that have openings away from the water bladder. The gel pack storage on the hip strap is a nice touch because you won’t have to be a contortionist to reach your gel packs during your run like you would if they were stored in a back pocket. The emergency whistle this pack includes could help you with any dangerous situations that happen while you’re running.